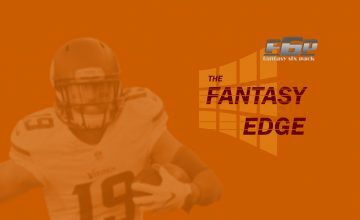 2018 Fantasy Football Week 2 Preview: When Dak? Sometimes you just wonder. What are the makings of a football comeback? Where does it come from? Does it gestate from opening kickoff? The Bears and Packers had one of those strange occurrences last Sunday where something legendary in this rivalry happened. Aaron Rodgers, the king of comeback spectacle, once again robbed another team of a victory late in the fourth quarter. Yep, more video clips to add to a growing montage for Mr. Rodgers and his merry men. They now host the Vikings in another rivalry with different frosting. If this matchup doesn’t pull you in, nothing will. September football tends to be the opening act where we get to know the characters. Some left the stage early, especially notable are two top fantasy tight ends. Apart from them, we survived some major frights with Aaron Rodgers and Leonard Fournette looking positive for Week 2 appearances. The last time the Packers overcame a 4th quarter 14+ point deficit at home and won their next game was in 1992. The Lions have lost nine of their last ten on the road following a home game where their QB had three or more interceptions. Since 2003, the Cowboys have won four straight times at home following a road game where they went scoreless after three quarters and had less than 100 yards rushing. The Colts have won their last five games on the road against a non-division opponent after losing at home with over 300 passing yards. The Cardinals have lost their last 12 games following a home loss where they scored under 10 points. The Patriots have won all their meetings with the Jaguars since 1999. The Seahawks and Bears will matchup on Monday Night Football for the first time. Another fun fact about this game is that the Packers at home have a history of crushing the Vikings when both teams are coming off wins. Green Bay won the last three in this situation with a combined score of 121-17 going back to 2007. Pretty good record, but the 2018 Vikings far excel their predecessors. These Vikings are on a mission for a Super Bowl. The bigger situation is what happens now with Aaron Rodgers. His knee sprain looked quite serious until he took to the field and with a slight limp tied the Bears defense in knots. A memorable comeback and another scalp for Aaron Rodgers in the fourth quarter. The Vikings secondary has Xavier Rhodes, who is a league shutdown corner. This is where Jimmy Graham comes in very useful for Rodgers to draw the safeties from helping Rhodes in coverage. If the Packers can keep free safety Andrew Sendejo occupied, it might help. Still, it is by no means easy for Rodgers to execute unless the Packers can establish the run better than they did against the Bears in that dreadful first-half. As for the Vikings on offense, they have less to worry about with Clay Matthews because the Vikings have such a strong running game with Dalvin Cook and Kirk Cousins thrives on play action. Let’s not forget, he isn’t near the top in this area, but Cousins is a proficient and sound bootleg quarterback too. So although he is not what you’d call a read option type of guy, he can sometimes sure make it look that way. Look for Stefon Diggs and Adam Thielen to provide the Green Bay defense with problems. The Packers must pressure Cousins and I believe that is the key to this game. The Packers cannot invite a shootout and need this game tight as possible. A game where both teams could use better news from their running back injury reports. The Patriots look to have Rex Burkhead back, but since he missed a lot of contact practice, may not feature much on Sunday. Sony Michel seems closer to starting in his first NFL game, so things are slowly on the mend in New England. As for the Jaguars, well, looks like their lead back is continuing where he left off last season. Leonard Fournette looks like a game-time decision in a late Sunday afternoon contest. As we all know, this shortens the options for owners. I really find this type of fantasy hardship annoying to deal with when I’m trying to enjoy football with the early games already in the fourth quarter. Anyway, the Jaguars have a long losing streak against the Patriots dating back to 1999. This time they might have a chance of breaking it. The Jaguars have a monster defense and the Patriots are thin at all positions except tight end and quarterback. Tom Brady and Rob Gronkowski simply cannot do it all. Fortunately, they still have James White who is in no small part a key player for the Patriots to have success. The Jaguars with or without Fournette are comfortable enough with their depth and Blake Bortles should face challenges no less unusual than other games – himself. Bortles needs a consistent game to overcome being too one-dimensional – an offensive trait that Bill Belichick defenses love to exploit. A good matchup to close out the Sunday action. Not so much because of the rivalry, but both teams are coming off sour losses and poor offensive output. After a confident rookie season in which Dak Prescott practically forced Tony Romo into retirement, we turned the page and lost interest in the book. 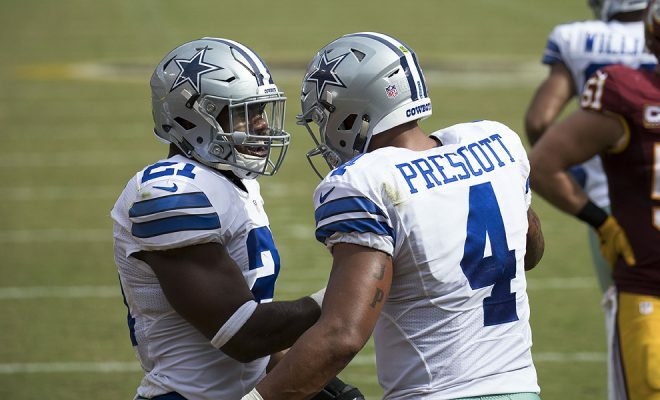 The Cowboys really need a fresh start – again. Jason Garrett is in his 8th year as head coach and led the Cowboys to the playoffs twice, but never advanced. It seems to me something systemic is affecting Dallas. Although Dez Bryant is a loose cannon he still said something very telling about his former team. To summarize, Bryant complained about unimaginative playcalling and predictable lineups in Dallas. That is exactly what we saw of the Cowboys in Carolina last week. They missed a huge chance to steal a victory from a team clearly not playing their best football. Although the score stayed close, the Cowboys did not appear to threaten the Panthers control of the game. On the other hand, the Giants did at least look competitive in their loss to the Jaguars. This is a fresher looking team than Cowboys. This is a team with a new coach and a new outlook. They have a great star running back, receiver and a veteran quarterback ready to give it all for his remaining time. The attitude all around with Pat Shurmur is improving. This is a similar team dichotomy clash as we saw with the Rams and Raiders last week. The team with the fresh green shoots should prevail handily. Somehow, in all the hundreds of games played on Monday night, not once since the Seahawks entered the league in 1976 have these two teams met. Granted, they both played in different conferences for decades, but it’s still long overdue. Both come into this game with very sombre losses. This probably goes double for the Bears as they dominated the Packers for an entire half only to lose at the hands of a hobbled Aaron Rodgers. It’s an interesting matchup. Russell Wilson will have to deal with an exotic Bears front which nearly knocked Rodgers into 2019. If Wilson thinks he’ll find RPO daylight, forget it. Like the Packers, the solution lies going deep with an up-tempo scheme. Unfortunately, the Seahawks do not run their offense quite as smoothly as Packers do. Not only that, the Bears will exploit any weakness in the Seahawks line and continually penetrate the backfield. No hope for a running game to get going here unless the Seahawks figure out a short passing game to get first downs. I sense however, the down and distance Seattle need to make up from sacks and holding penalties will lead to three and outs galore. I expect the crowd in New York to give Frank Gore a major ovation after he leaps Curtis Martin for all-time career rushing. Gore will now hold the number four spot if he can manage just 15 yards. Curtis Martin played most of his career with the Jets as some of you no doubt recall. I wonder if Martin attends the game? Even prior to the injury to Devonta Freeman, we began to get a sense Tevin Coleman was about to take over as the top running option in Atlanta. This opportunity came last year while Freeman sat out, but somehow this time there is clearly a shift. The difference now is that Coleman can establish himself early in the season. The Panthers put a clinic on Ezekiel Elliott last week, but the Falcons have a far more dangerous passing attack to deal with than the Cowboys. This is how stars in the NFL often come about. Opportunity. Pettis is about to have his with Marquise Goodwin out for another week. Pettis is one of the best spec adds of the week and he could turn out as a top waiver grab of the year too. One of the quieter waiver choices this week, but Smith steps into a potentially lucrative fantasy role which many believe just translates into more targets for Corey Davis. We don’t know that for certain until after we see what happens against the Texans. I would not hesitate on a spec grab here. Nervous times for Jones owners because it looks like the Golladay genie is out of the bottle. One week never tells the whole story and Jones is just too good to not get something going. Nevertheless, he is a crucial fantasy player to watch this week which could determine future of the Lions target share for 2018.